Our Square chambered Fusion-16 digital glass kiln comes with a viewing window as standard, and operates on a standard 13amp domestic electrical supply. Its square firing chamber makes it the ideal kiln for fusing glass tiles or wide glass projects. You can also fire small glass bowls, pendants, earrings, cufflinks, and even bracelets. Try out the newest glass techniques taught in seminars and books. Enjoy making stunning dichroic glass jewellery. Make gifts that your friends will treasure. When you own a Paragon Fusion-16, you can endlessly experiment with glass fusing. The Fusion 16 heats from the lid and radiates the heat down over your wares. This gives a very even heat distribution across the glass surface throughout the whole firing. The lid elements are mounted in pinless element grooves. The elements do not need pins, because the element coils are wider than the groove opening. The Fusion-16 has a TWO YEAR warranty, and you are always welcome to contact us for advice when you are setting you kiln up, or about to fire it,.. we're here to help! The temperature sensor, called a thermocouple, is covered with high-nickel stainless steel sheath for long life. A heavy steel base supports the reversible brick bottom. These features are an assurance that your new Paragon kiln is built to last. Included with the kiln is a self assembly sturdy metal stand. The reliable Fusion-16 has two mechanical relays for long life. (The relays turn on the heating elements after receiving a signal from the digital controller.) The two relays in the Fusion-16 last longer than the single relay of competitive kilns, because less amperage goes through the dual relays of the Fusion-16. * 13amp plug in the wall supply. * Program up to 8 segments (steps) in Ramp-Hold mode. * Fire to a single temperature at a single speed in Single Speed mode. * Store up to 4 programs in Ramp-Hold mode. 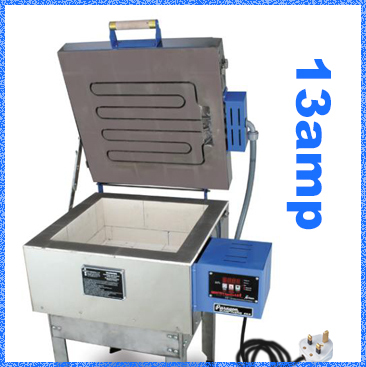 * Change the target temperature in Ramp-Hold during firing without stopping the kiln to reprogram. * Hold (soak) the temperature in both Single Speed and Ramp-Hold. * Add Hold Time during firing without having to stop the firing to reprogram. * Easily control both heating and cooling in Ramp-Hold. * Program Review lets you check the program you are about to fire. * Program the Temperature Alarm to sound when the kiln reaches a specific temperature. Program an alarm that will remind you to check on the kiln. * Thermocouple Offset adjusts the thermocouple readout. * Set the Delay to turn on the kiln at a time that best suits your busy schedule. * Error Messages report mechanical problems. * The sealed touch pad keeps out dust and is easy to wipe clean. * LED Lights show whether you are in program, review, or firing mode. * Colourful, illustrated instruction manual.